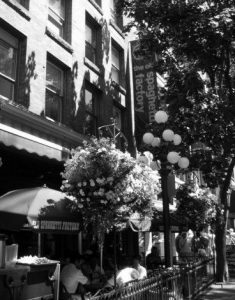 The first Old Spaghetti Factory restaurant opened at this location in Gastown in 1970. Located in what was once the headquarters of W.H. Malkin Co. Ltd. (grocery wholesalers), the restaurant is wonderfully decorated with antiques and artifacts from yesteryear. The Old Spaghetti Factory has four ghosts in residence. The first and best known is the spirit of a tram conductor. He frequents the old trolley car that’s parked inside the restaurant and contains dining tables. The trolley, Number 53, was once a part of the British Columbia Electric Railway Company’s fleet of electric trams. Built in nearby New Westminster in 1904, it served as a public transit trolley in and around Vancouver for many years. In 1957, it and dozens of other trolley cars were decommissioned in favour of the electric and diesel buses that are commonplace in the city today. 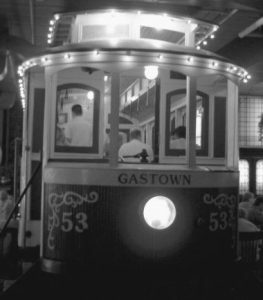 The trolley car was installed in the building in 1969, during the set-up of the restaurant. It’s up for debate whether the conductor’s ghost came with the trolley or not. Some say he died in a collision on an underground rail line below the restaurant. But this is unlikely because Vancouver’s trolley cars all ran at street level. And as the building has no historical connection with the B.C. Electric Railway Co., the ghost probably came with the tram car. Regardless of his origin, various staff members have seen the ghost of the uniformed conductor. He always appears seated at the same dining table inside the streetcar late at night, after closing. Also, place settings are moved by unseen hands, and inexplicable cold spots are experienced inside the car. The second ghost at The Old Spaghetti Factory is a small, mischievous spirit with a ruddy face and bright red hair. Simply known as the Little Red Man or Looky-loo, he calls out to staff members by name and strolls through the kitchen. His favourite prank is to surprise female customers in the ladies’ washroom. On one particular occasion, two ladies saw the dwarfish man leave one of the cubicles, dressed in a red shirt and red long johns. After looking at them and laughing mischievously, he left through the washroom door. To their surprise, nobody else had seen the unmistakable man leave the washroom. It’s said that one of the women took a picture of the ghost. But when the film was developed, he appeared as a blur. Nobody knows who the little red man is or why he haunts the restaurant. One thing’s for certain, however — he’s a devilish little fellow. The restaurant’s third ghost is that of a young boy. In early 2012, this ghost gave a female server a terrible fright. She was in the back section of the restaurant, helping to close up for the night. While she was busy resetting some tables, a boy ran past her towards the very back. With it being so late and no customers left in the restaurant, she thought it was strange that a boy was running around. So she followed him. The boy ran under a table alongside the back wall, turned around and looked up at her. When she looked at his face, she saw that his eye sockets were empty. Terrified, she ran to the front of the restaurant to tell the manager about what she’d seen. She told him that she couldn’t work at the restaurant any longer and resigned on the spot. A psychic visited the restaurant and identified the ghost of the little boy as Edward. She also pointed out that there’s a vortex located at the back of the premises. (A vortex is a supposed portal to other dimensions that enables spirits to come into our world. Some also believe that vortexes are linked to the Earth’s electromagnetic field. This influences where and when these portals open and close.) She also claimed that several small artifacts that decorate the restaurant have spirits attached to them. The boy ghost is thought to be responsible for bending cutlery on tables in the back of the restaurant. One night during closing hours, a staff member walked through the back area to check that place settings had been properly laid out. He was stunned to see that each cutlery item was bent upwards on one of the tables. Other staff members saw the bent cutlery, too. But by the time they brought the restaurant manager over to see, it was all back to normal. In addition, the ghost sometimes places a dining chair on top of a table in the back section, which the staff find in the morning. In 2015, another server had an encounter with Edward. After closing, she saw the boy dressed in a flat cap, wool jacket and corduroy pants run towards the back of the restaurant. She chased him and, as he’s done before, he ducked under a table. She ran to the front of the restaurant to take the manager back with her to see the boy. But when they got there he was gone. And then they noticed that the place settings had been disturbed — the cutlery was all in a pile in the middle of the tabletop. On another occasion, a customer sat in a row of booths behind the entrance to the restaurant. She saw the boy reflected in a mirror on the back wall. He was using an arm to spin around a narrow column behind the front desk. When she turned around to look at the boy, he’d vanished. The fourth ghost in the Old Spaghetti Factory is of a little girl who appears at a table in the front window. She sits and holds a balloon. Nobody knows who she is. Once, a friend of the restaurant’s general manager had a conversation with her that lasted several minutes. The little girl explained to him that she was looking for her mother. When he returned to the table after telling the manager about her, she’d disappeared.